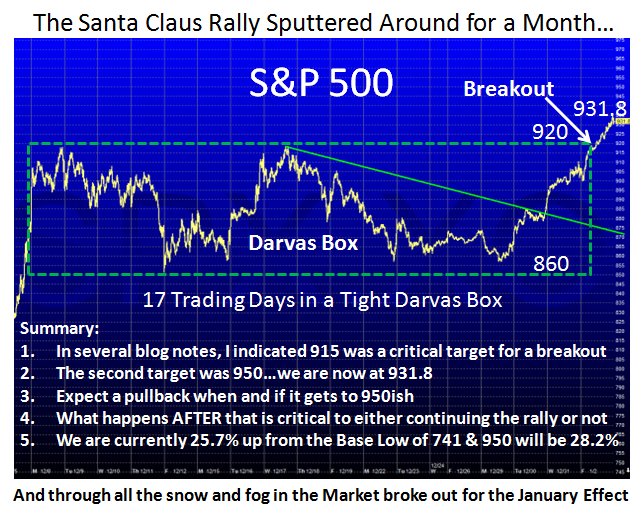 Ian Woodward's Investing Blog » Santa’s Late Delivery…The January Effect! 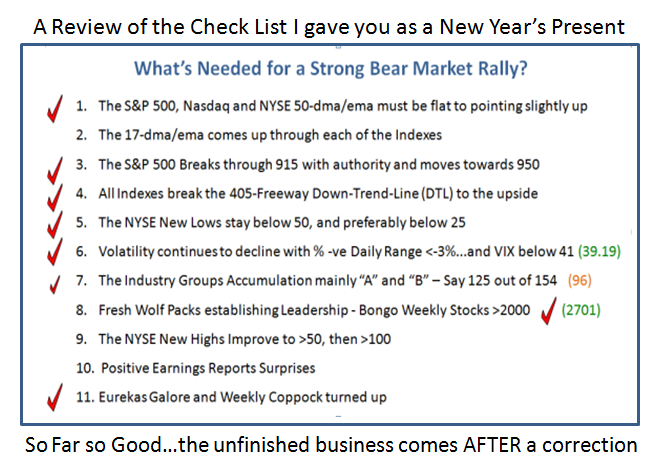 « What’s Needed for a Strong Bear Market Rally? 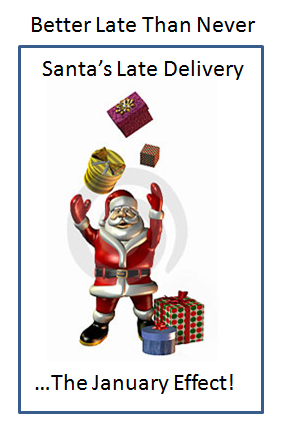 Santa’s Late Delivery…The January Effect! I had virtually written off the Santa Claus Rally when it sputtered for three weeks before the Holiday, but it came to life with a Late Delivery going into the New Year with the so-called January Effect. 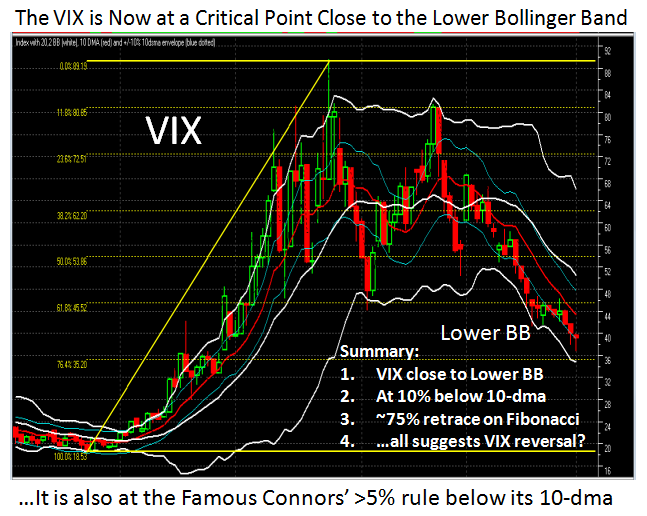 We can see from the summary notes on the chart we are now over 25% up from the Base Low and this is where we normally expect some form of correction sooner than later. Since we have two weeks to go to the first big blush of Earnings Reports which then peak by the first week in February, we might be able to eke out a move to 950 or so before we see a pull back. It is what transpires after the current rally peaks as to whether we continue with the Bear Market Rally or once again fall back into the doldrums to retest previous lows at 915 and 860 where we should see support. Anything below that and I am afraid it was all for naught, and only short term players would have benefitted by being nimble both on the way up and down. short side of the market. However, there still seems to be some room for the Bulls to dance as we look at the longer term picture using both an 89 and 40 period Weekly Chart of the Bollinger Bands. 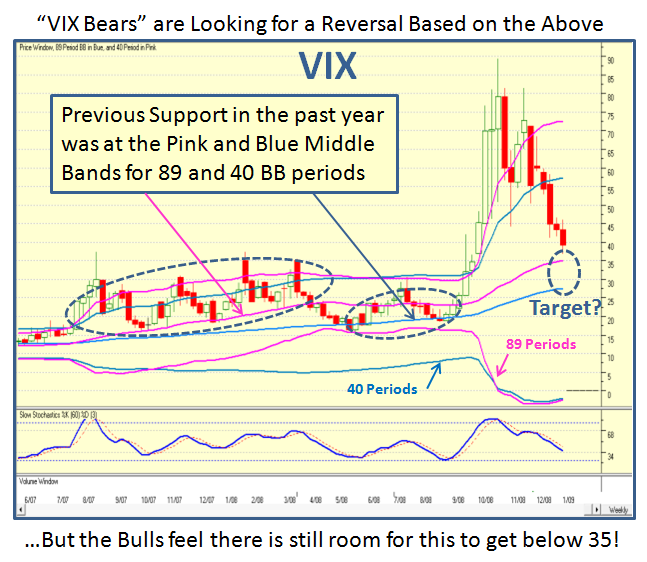 If we are to look at this with rosey tinted glasses, there is still room for the VIX to descend to get down to at least 35 or even as low as 27 before we see a jolt back by the Bears. 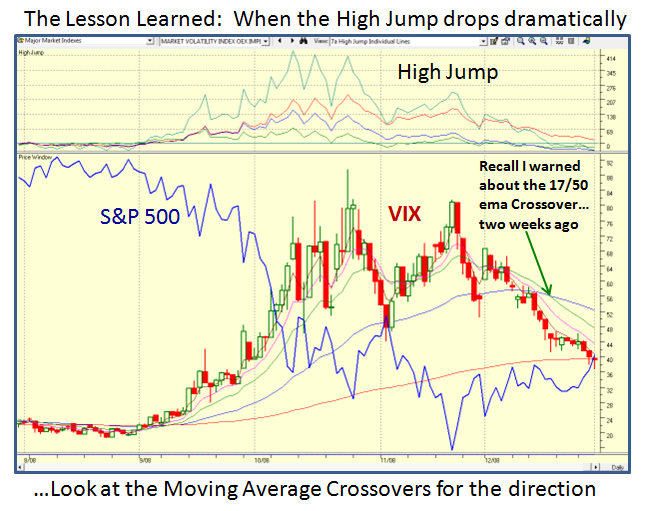 As my Christmas present to you, I showed you how I used the High Jump with the Moving Average crossovers to pinpoint that the momentum of the market was in driving for a Lower VIX with the 17-dma crossing down through the 50-dma, and I am glad I called that right. Since all short-term Moving Averages are still pointing down it suggests we still have some time for this market to continue its rally…maybe for a couple of weeks more with luck, before we see a pull-back. 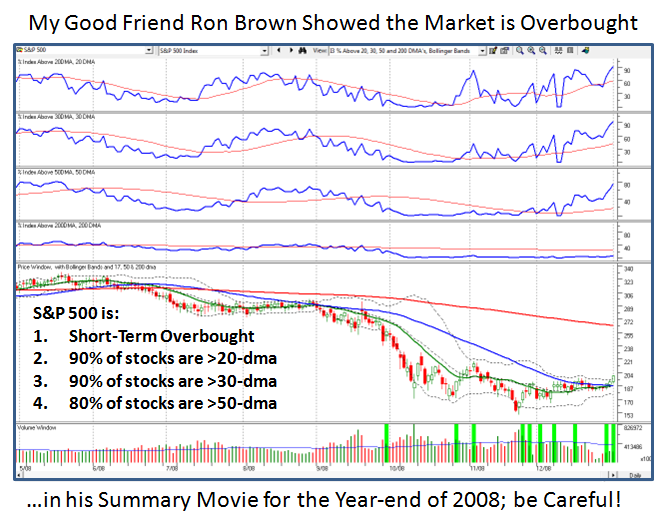 Last but not least, to bring us back to our senses so that we don’t get too carried away with euphoria I show you a chart which my good friend and partner, Ron Brown, showed in his Weekend Summary Movie where he reminded us that the Market in general is short-term overbought. Note how the readings of the stocks above their various moving averages are all at the upper end of the spectrum where one should at least be alerted to a pull-back. I wish you a Very Happy New Year and may all your stocks be winners! 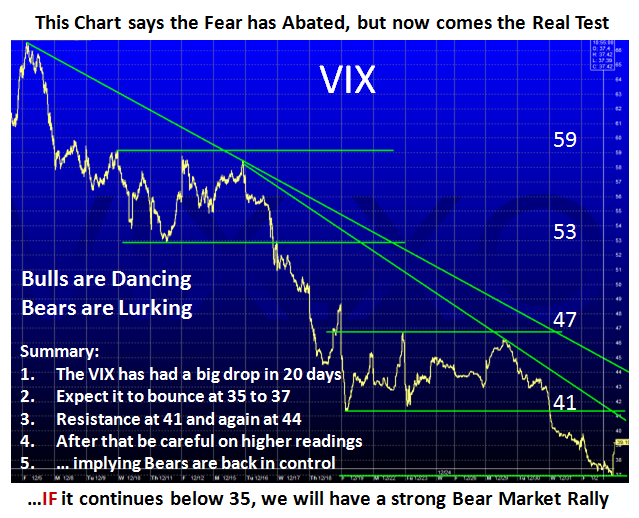 This entry was posted on Saturday, January 3rd, 2009 at 10:55 pm	and is filed under HGS Principles, Market Analysis. You can follow any responses to this entry through the RSS 2.0 feed. Both comments and pings are currently closed.